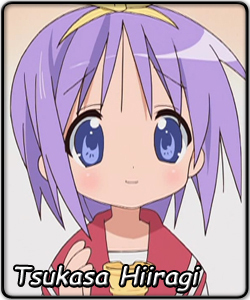 Tsukasa Hiiragi is an ordinary high school girl of dim-witted cuteness. Occasionally she comes up with adorable misconceptions and fumbles in heart-warming (or heart-overloading) ways. Some of her more memorable Moe scenes would be struggling with her first cell phone, trying to count a rhythmic 1-2-3 while falling over every hurdle on sports day, and learning not to feed the deer. She can get a spontaneous mob of otaku surrounding her and taking photos - when this happens, she helplessly shrivels up in shyness forcing her twin sister Kagami to rescue her. Her association with Balsmic Vinegar comes from one ep where she was repeating those 2 words in her head because she liked the sound of them, after hearing them on TV. Gee whiz, if Tsukasa ends up struggling on how to use her first cell phone, you would wonder what would happen if she ran into dolls. In her first year in the Saimoé Circuit, Tsukasa made waves in Korea where she blasted through the preliminaries, becoming one of the huge favorites in Korea Best Moe 2007. She followed her performance with a 61-vote victory over her first Rozen Maiden opponent, Souseiseki. However, in the round of 32, Tsukasa ended up losing to Louise Françoise (Zero no Tsukaima) by only 7 votes in a 979-972 upset. Tsukasa finished that tourney in 19th place. In Japan, she made even bigger waves by dominating the first two rounds of the tourney, even going as far as forcing one competitor to under 100 votes in what was to be a huge turnout of votes. However, she was hit with a close call, narrowly edging San Seto (Seto no Hanayome) 1519-1448 to move on to the top 16. It was then that she clashed with Souseiseki's twin sister, defending champion Suiseiseki. In a huge match with a huge turnout, Tsukasa scored a defining upset over Suiseiseki 1741-1559 to move on to the round of eight. However, in the round of eight, Tsukasa's third Rozen Maiden, Shinku, came prepared with a volleyball, and Tsukasa's lack of athleticism somewhat cost her, as she lost in the quarterfinals 1697-1639, a margin of 58 votes. Tsukasa finished in 6th place. Tsukasa, along with twin sister Kagami Hiiragi and friend Konata Izumi, received an invitation to participate in Korea Super Best Moe, but they did not find much success. While the latter two argued their way to oblivion, Tsukasa was caught in a blackout, and when power was restored, she ended up missing the top 16 by 10 votes, eventually losing to Shana (Shakugan no Shana) and Mikuru Asahina (Suzumiya Haruhi no Yuuutsu). Serving as the mediator (somewhat) to Kagami and Konata, Tsukasa will be working hard to try to prove that she has what it takes to win the International Saimoe League. She will also enter Saimoe Japan 2008 as well, and she hopes that this league should give her some more experience among some prestigious opponents. Rematches with the Rozen Maidens are ahead for her, as well as more opponents such as the two Nanoha heroines, the cast of Higurashi, and even the SOS Brigade. That being said, assuming she doesn't get lost, she could be well on her way to winning the International Saimoe tiara.